Because of policies in government, children have been separated from families at the border as they seek a new life in America. 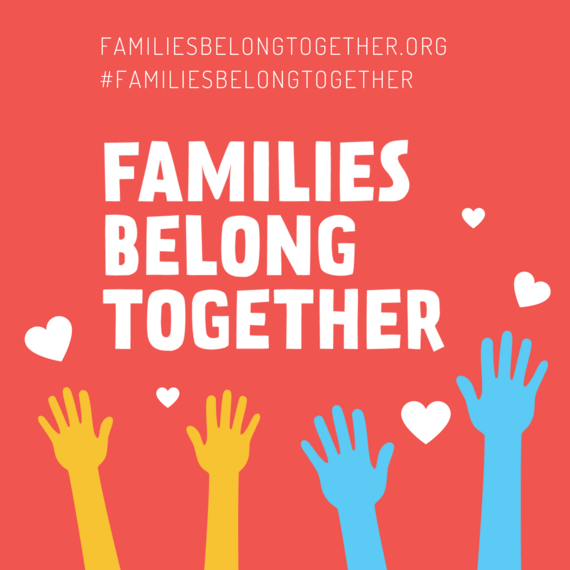 Today, June 30, is the official day of action for Families Belong Together, a movement to end family separation and detention and reunite loved ones. Talking about politics is hard. Thinking about the broken lives, the cries of these children, the unknown outcomes of these families is even harder. However, as a writer, it's important to stand up for what I believe in and use the power of words (the skill I know) to use my voice for good. If you want to argue and fight me on this, please go do that elsewhere. I'm not up for political debate and I'm not in the business of creating laws. If you're also feeling heartbroken and wondering what to do as a writer and citizen of the world, this post is for you. Immigration is a tough, complicated issue with many sides. As a citizen of the world, it's important to understand what's happening and to do something about it. I've broken this down into three sections: To Act, To Educate and Read, and To Write. Hopefully, this post educates, evokes empathy, and empowers you to understand this issue and take action as you see fit. If you need information about what's happening with immigration in America right now, read Joanna Goddard's article "On Stopping Family Separation." She breaks down the issues clearly and logically, defining things as necessary, with facts. If you're ready to do something, Lunchtime for Change has you covered. Whether you want to donate, rally, or sign a petition, they've got the resources ready for you. If you need a quick and easy way to write your officials and share your opinion, text ResistBot. It's as simple as writing a text, it's free, and it makes sure your voice is heard by the people who are elected to make a difference with political issues. Literature helps us empathize, understand, learn, and grow. Educate yourself on what it means to be an immigrant, to be of both plural and partial identity as one seeks opportunity in a new country, to be a human in the midst of this political battle. 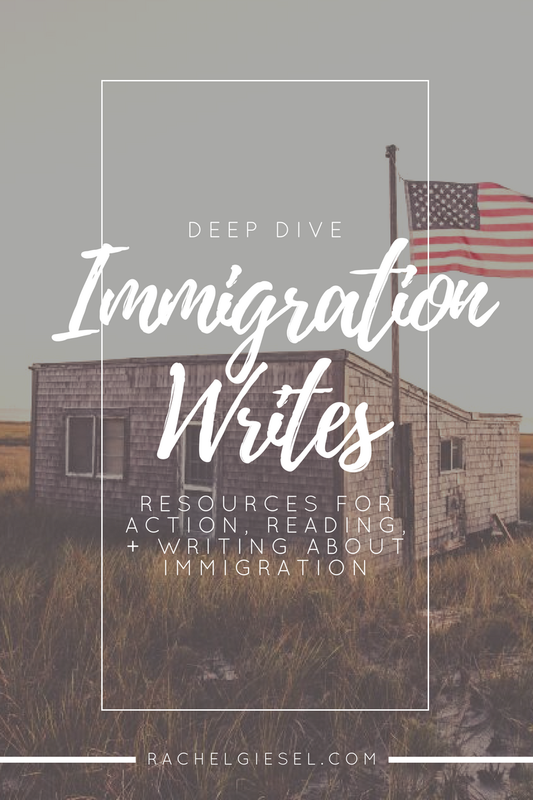 The following articles, websites, books, and podcasts all discuss various aspects of immigration in a variety of ways. They are listed and annotated below in no particular order. This website is about 4 years old now, but it gives great historical and personal insight into just what happens at the Mexican-American border, who is crossing and why, what the wall/fence looks like already, and real stories from real people who live there, cross, and are US citizens. Brief essays. A flood of voices. Immigrants telling their stories in their own words, collected in one place. The heartbreak and love in each of these stories will move you; the immensity of stories told is powerful. This is a project that will overwhelm you in the most necessary way. While not directly related to immigration, this podcast discusses the issues and aims of translating one language to another. Douglas Hofstadter attempts to translate a silly little French poem to humorous and diverse affect. Then, because he feels as though he can't get it quite right, he enlists the help of a wide variety of French translators, who all have their own unique interpretation as well. Listen to this for the humor, the silliness, and an accurate look at the beauty and limitations of literature in translation. I LOVE listening to Carrie and Octavia talk about books, literature and writing. In this episode, they interview Julianne Pachico about her linked short story collection/novel about Colombia and discuss what it means to be an immigrant versus an expatriate, the writers who have chosen to write in English despite it being a second language, the translation of literature into English, the influence of the United States and western literature on publishing, and more books+immigration issues. I fell in love with this book because of it's dynamic characters and fantastical approach to discussing the immigrant experience; I'll keep talking about it because it feels so accurate. Hamid's novel is one of love and heartbreak, a deep dive into the relationship of a couple as they find solace in each other and then develop into different people as they escape their home country. Protagonists Nadia and Saeed travel through magical doors (an apt metaphor that describes this process, I believe) that transport them to new countries, seeking a better future and themselves in the process. Listening to the audio book in Hamid's voice juxtaposes lyrical prose with unflinching reality and tone—the truth is beautiful, broken, and honest. This poem comes from my undergrad poetry partner, the beautiful and skilled Crystal Stone. She writes about the current immigrant crisis, the children, the feelings of "alien-ness", and dreams. She breaks my heart with this and captures my feelings exactly. She writes, "I mourn / I don’t have the language / to mother you / while you wait for the one / who carried you / into what she thought would be greener / not grayer / grasses" (Stone). Rushdie's critical essay is dense, but contains a magnitude of insights into what it means to have both plural and partial identity as a migrant person. He discusses what it means to reflect back on where you've been and to look forward to where you're going. He wrangles with his own experience and memory as a British-Indian writer. For big ideas and insight, read this. One of my absolute FAVORITE books of all time (and part of the reason my cat is named Oscar), Diaz's novel follows the ancestral and cultural history of Oscar as he seeks to discover himself in America and the Dominican Republic. He seeks to understand himself as both a member of the United States and a member of the Dominican Republic, but he doesn't seem to "fit" anywhere. A novel rich in Dominican history and values, raw and brutal language that code-switches between English, Spanish, and esoteric "nerd" language, and the coming-of-age identity story of a boy who just wants to be loved, The Brief Wondrous Life of Oscar Wao is at the top of the must read list. Yezierska writes about her struggles to assimilate in American culture in 1929 as she seeks the American Dream but works in a wealthy home and a button factory. Her prose is a diary exploding with emotion, hope, and heartbreak. Even though it's dated in 1929, her ideas of opportunity and possibility juxtaposed with the reality of work ring true to immigrant experiences today. Amy Tan does a marvelous job of defining what it means to be a child born of immigrant parents. She contrasts parental traditions, hopes, and dreams with the child's desire to assimilate into American culture. Her essay "Mother Tongue" speaks to the beauty and limitation of language as it pertains to her experiences simultaneously as a writer in English and daughter of a woman who speaks a different kind of English. Tan writes how she "winces" when people describe her mother's English as "'broken,' as if it were damaged and needed to be fixed," when really it's something else entirely. In her short story "Two Kinds," Tan writes about a mother who wills her daughter to be a piano prodigy and a daughter who wants to defy her mother's wishes at all costs. It accurately fictionalizes the relationship many mothers with dreams and daughters with rebellion have, but also demonstrates the hope of a better life juxtaposed with the reality of a new generation. Designed as a class and complete with links to articles, essays, primary documents, educational films, and video games, UMN's immigration class is long, deep, and educational about the facts and history of immigration in this country. Simply browsing through it makes me realize I have much much more to learn about this. We are writers, and we write. Whether you want to take a deep dive into your own immigration story, fictionalize the reality of the world today, or simply reflect on your feelings about what's happening, I urge you to get your truths on paper with the written word. Here are 4 simple ways to write about immigration right now. Write a creative nonfiction essay about your own family's immigration story. Research your family's history. Where did your ancestors come from? Why did they come to America? What struggles did they face? Use the internet, ancestry.com. Interview your family members. Write an essay about where you're from, your familial journey to how you ended up where you are today, and the way you infuse (or don't infuse) cultural tradition into your own life. Your story matters and I want to hear it. Write about the experiences of other immigrants. Interview and listen to the stories of immigrants, giving voice to those who don't consider writing to be their passion and skill. It's important to write what you know, but it's just as important to research, understand, and write the experiences of others (carefully). Write a novel, a short story, an essay, a documentary (anything!) with research and compassion. Write your feelings. Choose a form that feels right—poetry, essay, short story—and write what you see, what your heart feels, what actions you take or don't take. Express what it means to be you and know these things about immigrants in the world right now. Be honest, authentic, true. I believe in a world where people matter. I believe in opportunity and hope. I believe in listening to other people's experiences, in creating a world where voices can be heard. I believe no human is inherently illegal. I believe families should not be separated. I believe in love. Write about your own immigration story, raise the voices of others, and take action to be the change you wish to see in the world. What are your favorite stories and resources about immigration? How are you raising your voice with this issue? What are you doing in your writing life to change the world?